Winkio wants to put a mood ring on the world, and you can help. Have you ever wondered how world events are affecting society as a whole? So does Winkio, and the social experiment site is doing its best to give you access to that information. At its most simple, Winkio just wants to know how you are feeling, what you are doing and what are you concerned about. However, it’s what the site does with this information that makes it something truly unique. If you’re a graphs and information junkie, then Winkio is going to have you drooling as it gains users. The site will take all of this information and then input it into a database that then produces a series of graphs and color-coded maps. These graphs and maps, as well as pie charts will let you truly get an idea of the pulse of parts of the world. Or, rather, they will once the site has enough users to truly get an in-depth report. 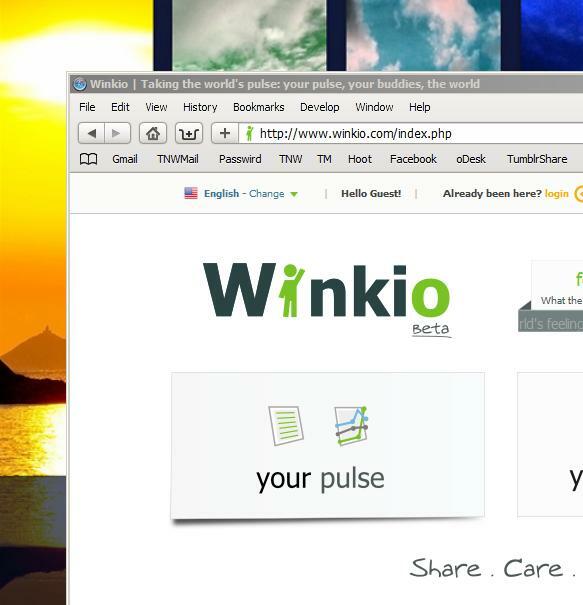 There is, of course, a social network aspect to Winkio. However, to be honest, it’s not the most drawing feature of the site. The social part will alert you to the moods of your friends, but more importantly it will let you reflect on and respond to happenings in the world. In short, not yet. The site needs considerably more traffic in order to make any sort of true conclusions. However, that’s why you’re here, right? So now that you’ve read about it, give it a shot. Let’s see what interesting things we can find with Winkio. Read next: Would You Pay More For A Video Enhanced E-Book?